Marie’s real life experiences, judicial and legal training have prepared her to be the next Second City Court Judge of Algiers. 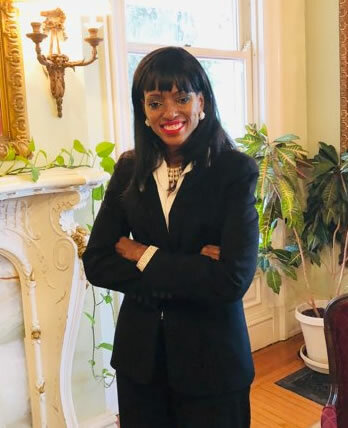 Attorney Marie Williams-Brigandi is a Candidate for Second City Court Judge of Algiers, for the Parish of Orleans in the upcoming Election. Marie is a former Administrative Law Judge and she is the only candidate in the race who has served as a judge. Marie is also the only candidate who is a member the Orleans Parish Democratic Executive Committee. Ms. Williams-Brigandi has been a member of the Orleans Democratic Executive Committee since 2008 and was re-elected in 2012. She has distinguished herself in the legal profession as a seasoned attorney during the past sixteen ( 16) years, having been honored with numerous awards which include: 2010 The City Business Leadership In Law (along with Jim Letten and other federal judges and attorneys), for legal professionalism and community service; McDonogh35 Senior High School Career Day and Speaker for Various Programs; Orleans Parish Public Schools Speaker and Volunteer; Xavier University academic mentor and frequent speaker for Phi Alpha Delta; Teen Court Volunteer; The Pro Bono Project Staff Attorney and recognized from 2005-2010, as a Louisiana Disciplinary Hearing Committee Board member. She has received many awards. Marie has been and is active in the community, a current member and former board member of the League of Women Voters, AIDS Law and other organizations. She has coordinated Battered and Homeless Women and Men legal and Succession clinics where free legal advice was given and some cases handled. Also, Marie is a published legal author in Successions. Marie Williams-Brigandi, 41, is a graduate of The National Judicial College, Loyola School of Law and Xavier University. As one of seven children, Marie attended four New Orleans public schools: Lawrence D. Crocker Elementary, Henry W. Allen Elementary, Sophie B. Wright Middle School and McDonogh 35 Senior High School. and The National Judicial College. Marie’s legal career began in the area of complex litigation with the Law Firm of Daniel E. Becnel & Associates. Starting in 1996, she began to work on important consumer rights cases that forced entire industries, such as the chemical spills at factories, Tobacco and breast implant manufacturers, to correct their wrongful business practices. Thereafter, she focused her eye further toward public service, as a legal aid attorney doing work for low-income persons, disabled persons, and homeless individuals, fair housing victims, civil rights victim and protecting the rights of workers at Service Employees International Union Local 100. Marie Also worked in the Criminal field on death penalty appeals. One of the death penalty cases. Marie helped to prepare the brief that was accepted and heard by the Supreme Court. The case was overturned. Moreover, Marie has done many handled many cases in Civil District Court, city courts, traffic and municipal court, bench and jury trials. Marie’s plans to improve the efficiency of the Court? She will start court on time and stay late as needed. Marie will render speedy decisions in cases. She will push to make technological improvements in the court. Marie will utilize alternative dispute resolution methods to resolve cases. Lastly, she will coordinate with the legal community to ensure volunteer attorneys are available for parties unable to afford an attorney. Marie’s policy on staffing? Public announcement of position vacancies with merit selection regardless of gender, race, nationality or sexual orientation. If elected Marie will be a full-time City Court Judge. Marie is a mother of two children who attend St. Andrew the Apostle in Algiers and a military spouse whose husband served honorably in the Air Force and Army for more than twenty years. Her father also served in the Army and brother has been to Iraq twice, Ghana and is currently in Germany; he too has served more than 20 years in the Army. Marie’s husband was a PAC soccer coach before Hurricane Katrina and currently, he is a soccer coach for the Carrollton League. Marie is asking for your support, vote and endorsement. The citizens of Algiers deserve a person with experience and the temperament to serve. Williams-Brigandi promises “to be fair and unbiased and to treat with dignity and respect every person with a matter before the court, regardless of whether that person can afford an attorney.” Also, to educate the citizens of Algiers about the Courthouse that hears Small Claims Trials, Rules for Possession, and all other summary matters.